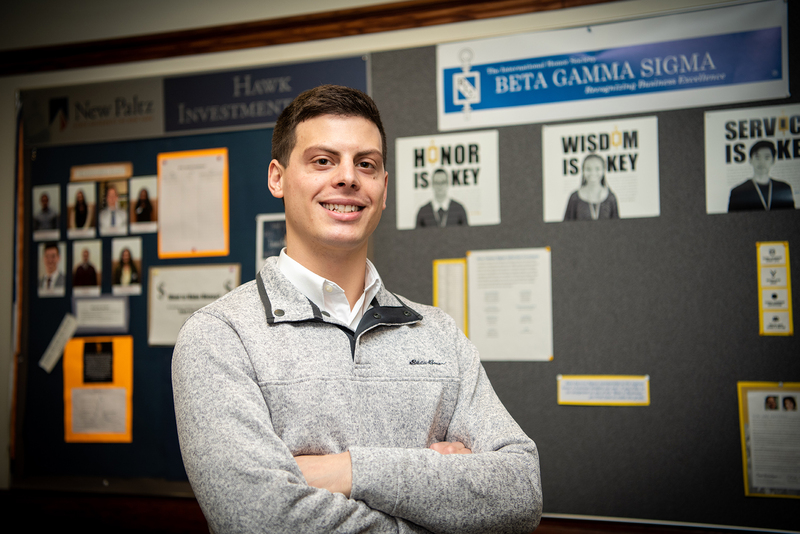 Walker Cacciatore ’18 (Finance) capped his career at SUNY New Paltz with a trip to the 2018 Beta Gamma Sigma Global Leadership Summit, a networking and professional development conference held in Chicago, Illinois for members of the international honor society for business students. Cacciatore, a transfer student from Kinderhook, New York, was able to attend the Summit thanks in large part to a gift from alumnus Gary Gregg ’77 (Economics) to the School of Business Applied Learning Program, a new fund designed to increase students’ access to unique learning experiences. Cacciatore, a May 2018 Beta Gamma Sigma inductee, joined hundreds of collegiate members, scholars, professionals and employers from around the world at this year’s Global Leadership Summit. The annual event offers world-class speakers, challenging workshops and case competitions, and, perhaps most importantly, opportunities to connect with fellow honor society members at various career stages. Prior to his graduation in December 2018, Cacciatore also served as president of the student-run Investment Club, which gave him an ideal platform for sharing his Beta Gamma Sigma experience with other New Paltz students. “Investment Club is actually where I met a lot of my friends here,” he said. “We manage a virtual portfolio and pitch individual stocks and bonds to each other, so it’s been really helpful for learning how to talk and think about investing. Now looking ahead to options for beginning his career (he has an offer from Mad River Associates, a private equity servicer based in Vermont where he interned during the summer of 2018), Cacciatore has been reflecting on the value of his conference experience, and how he might follow the philanthropic example set by Gary Gregg. Visit the School of Business online to learn more about the Applied Learning Program and about the multitude of business student associations available to SUNY New Paltz students of all majors.